I’ve only written one restaurant post before on this blog. The first one was about a sushi place in Vesterbro over a year ago, and I’ve definitely been to more than one restaurant since 2015. I’d love to write more about the interesting eateries I’ve stumbled upon in Copenhagen, so I figured I’d share this lovely taco place I food in Nørrebro. The Viking and I were doing some shopping a few weeks ago when we got distracted by this cute little place called Blue Taco. It had been a while since we’d been on that particular block, and it certainly wasn’t there the last time we walked by. We vowed to check the place out. A few days later, we were too lazy to cook, so we decided to head on over to Blue Taco. We walked down the stairs and found ourselves in a tiny, but adorable, joint. The available foods were colorfully listed on the wall which was easier than squinting at a menu. The Viking and I decided on three tacos each and 2 bottles of Jarritos soda. Anyone who’s met me even once knows that I’m obsessed with Jarritos. I was raised with it, and I’ve introduced it to many on my non-latino friends. It’s hard to come by here in Denmark, so I’m always over the moon when I find it anywhere. The interior of the restaurant is incredibly small (which isn’t unusual for Copenhagen), so there’s only room for a few stools a long the walls. It was a beautifully warm day, so the Viking and I found seats at a table outside. 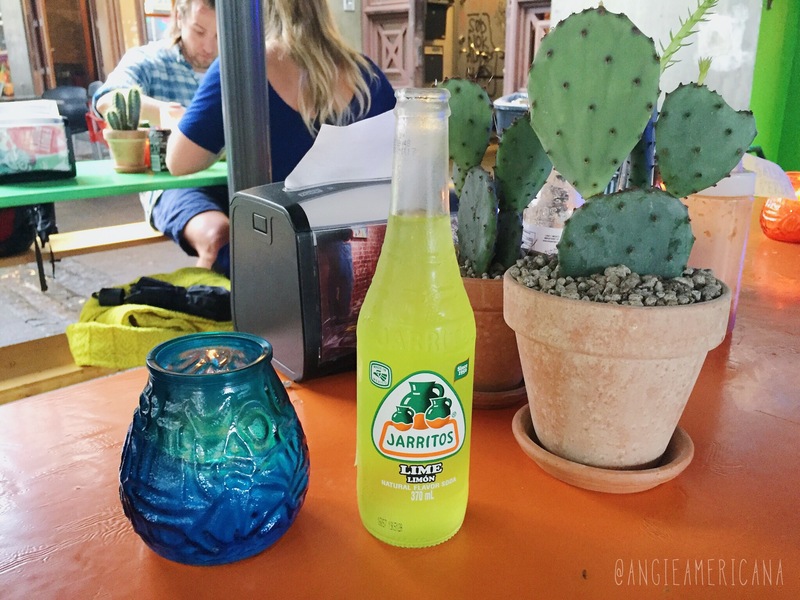 We sipped our sodas and eagerly awaited our tacos. Thankfully, we didn’t have to wait long. Our tacos were placed in front of us after only a few minutes. The tortillas were blue, hence the name the restaurant, and I was intrigued because they’re not that common. I took a bite out of the first one, and oh my god the tacos were tasty! The three I ordered (from left to right) were the chicken tinga, shrimp, and cactus. I only went with one vegetarian taco, because I’m an unapologetic meat eater. I would 100% order them again, and I plan to go back in the very near future. I’m usually pretty picky when it comes to tacos (since I grew up eating Mexican food), but they were so delicious that I would even bring my (pickier than I am) parents to Blue Taco. 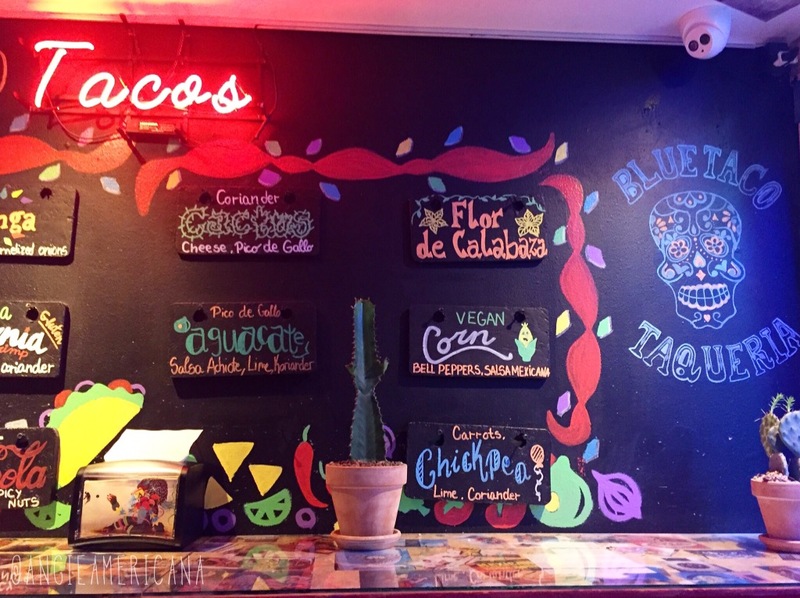 The best thing about this place is that nearly all of the tacos are gluten-free, and around half of the menu is vegetarian or vegan. A few of my friends are vegetarian, and it can be difficult to find places that have options for everyone. This is one restaurant we can all agree on. 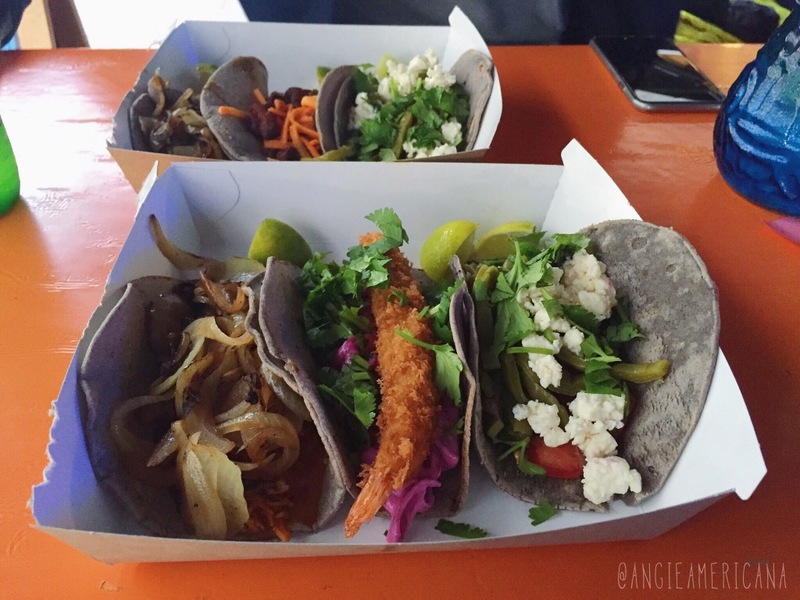 Have you ever eaten tacos made with blue tortillas? They’re worth a try!